The broad aims of the research are to elucidate the processes by which basal ice is formed, and to use that knowledge to interpret glacial sediments and landforms. Different mechanisms of ice formation, ice diagenesis, debris entrainment and structural deformation generate different physical and chemical characteristics in basal ice. 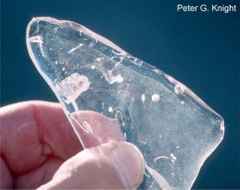 If the relationship between the processes of formation and the characteristics of the ice can be identified, then the basal ice exposed at a glacier margin, or retrieved from a deep ice core, can be used as an indicator of conditions in the inaccessible subglacial zone. In addition, if the basal ice characteristics of ancient glaciers such as those that existed in the UK can be reconstructed from the landforms and sediments they have left behind, then the characteristics of their subglacial environments might also be identified. Go HERE for some photos of basal ice. I started research in glaciology in 1984, when I started working for my Ph.D in the Department of Geography, University of Aberdeen, with a NERC-funded research studentship under the supervision of David Sugden and Chalmers Clapperton. The project was designed to ascertain the origin of the debris-bearing basal ice exposed in thick sequences at the margin of the Greenland ice sheet, and involved field observations at the Russell Glacier, near Kangerlussuaq, Greenland. The thesis, examined by Geoffrey Boulton, was called "On the origin of debris-bearing basal ice, West Greenland." Stratigraphic, isotopic (oxygen-18 and deuterium), structural, dynamic and sedimentological analyses of ice and debris from the ice-sheet margin indicated two zones of debris entrainment beneath the ice: one in the interior of the ice sheet and one close to the margin. These zones were characterised by different entrainment processes, and hence produced different basal-ice characteristics. Go HERE for some photos of the field area. Sugden, D.E., Knight, P.G., Livesey, N., Souchez, R., Lorrain, R., Tison, J-L and Jouzel, J. (1987) Evidence for two zones of debris entrainment beneath the Greenland ice sheet. NATURE Vol.328 no.6127 pp.238-241. Knight, P.G. 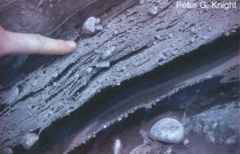 (1988) The basal ice and debris sequence at the margin of an equatorial ice cap; El Cotopaxi, Ecuador. GEOGRAFISKA ANNALER Vol.70A No.1 pp.9-13. Knight, P.G. (1989) Stacking of basal debris layers without bulk freezing-on: isotopic evidence from West Greenland. JOURNAL OF GLACIOLOGY Vol.35 No.120, pp. 214-216. Click here for abstract. Knight, P.G. (1994) Ice flow around large obstacles as indicated by basal ice exposed at the margin of the Greenland ice sheet. (with D.E. Sugden and C.Minty) JOURNAL OF GLACIOLOGY 40 (135), 359-367. In 2000, I started to develop the "final stage" of my long-term research programme, looking at how basal ice signatures can be identified in formerly glaciated areas such as the UK, and possibly used to identify former subglacial conditions. This involves interests in the moraines marking the southern margin of the former Laurentide ice sheet (working in collaboration with Carrie Patterson) and in the glacial landforms of the English Lake District, as well as continuing work in Greenland with Richard Waller and postgraduate student Will Adam. At the same time, I continued to work on the problem of understanding basal ice formation at present day ice margins, especially at my longstanding field site in Greenland. Knight, P.G. and Knight D.A. 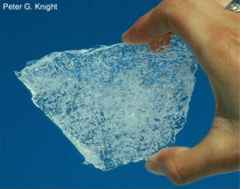 (2005) Laboratory observations of ice formation and debris entrainment by freezing turbid supercooled water. In Knight, P.G. (ed.) GLACIER SCIENCE AND ENVIRONMENTAL CHANGE (Blackwell, Oxford). Knight, P.G. and Cook, S.J. (2008) Glaciohydraulic Supercooling. PROGRESS IN PHYSICAL GEOGRAPHY 32 (1), 65-71. 2008-11: My research at this point was diversifying. I was continuing to pursue the "third stage" of my basal ice work, looking at UK-based glacial landscapes that preserved a signal of former glaciation. 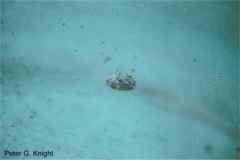 This included continuing collaboration with Simon Cook and Richard Waller, and some work with PhD student Aiden Parkes. At the same time I had been looking increasingly at links between glaciology (and geography more generally) and art, collaborating with artist Miriam Burke. I was also by this time getting more involved in pedagogic research, and after my major book project "Glacier Science and Environmental Change" I was also being called upon increasingly to contribute to review works such as substantial encyclopedia entries, and had embarked on a new book-writing project: "Glacier" for Reaktion books. The low-temperature laboratory was developed following my appointment to Keele in 1987. The need for the laboratory arose as a development of my fieldwork-based programme of glacial research. My research since then has combined field observations and laboratory experiments to understand subglacial processes. Field evidence for the internal characteristics of glaciers can be gathered from exposures of debris-bearing basal ice at glacier margins, but models built on this evidence are difficult to test in the field because of the inaccessibility of the subglacial zone. A low-temperature laboratory facility provides the opportunity to test both theoretically-derived and empirically-derived models of glacier processes in a convenient and controlled environment. The main subjects research have been the inaccessible subglacial zone and the englacial hydrological systems of glaciers. Research funded by NERC focussed on the transport of rock debris through the intergranular vein network of polycrystalline glacier ice, and research funded by The Leverhulme Trust focussed on the rapid freezing of supercooled water. In both of these projects Debbie Knight has been funded to work as a post-doctoral researcher in the Lab. Other work that I have supervised in the Lab has included parts of Paul Johnson's and Simon Cook's PhD projects, and a number of undergraduate dissertations. There is a tradition of laboratory experimentation in glaciology, but it has been confined largely to research in (i) ice physics and chemistry and (ii) simulation of flow and erosion processes. The programme of research being developed at Keele is unusual in that it aims to co-ordinate theoretical and empirical models through the experimental testing of model elements that are inaccessible in the field and cannot rigorously be tested in any other way.